All parents want to give their children the best possible protection. In the car as well as everywhere else. Even so, children are still suffering injuries or even dying because of incorrectly fitted child seats, or because the type of child restraint they were using was wrong for their age, height and weight. Or - even worse - because they were travelling completely unrestrained in a car. The cause of the problem is often simply a lack of knowledge. People sometimes think they have fitted a child seat correctly, when in fact they haven’t. They may think that a child can safely switch from a rearward-facing seat to facing forwards at the age of just one or two years. When it shouldn’t. They may think they have adjusted the safety belt correctly. When they haven’t. One Swedish survey revealed that only 40% of three- year-olds had a rearward-facing child seat, whereas all three-year-olds should still be using seats which face the back of the car. The same survey found that some users of booster cushions placed the diagonal belt under the arm instead of across the shoulder. Many parents were unaware that the lap section of the safety belt should go across the top of the child’s thighs, not across the stomach. A few children were even sitting in the lap of the driver or other passengers. Airbags were another area where serious gaps were found in parental knowledge. Over half the parents interviewed were unaware that children should not sit in a seat with a frontal airbag (unless the airbag has been switched off). This publication has been devised to help parents become better informed about the safety of children in cars. It should provide answers to many of the questions that new parents and parents-to-be often ask. Women sometimes ask whether it would be better not to use a safety belt when they’re pregnant. They fear that the belt could harm their unborn baby in some way. The answer to this question is that they should definitely use a safety belt at all times, right up until the birth. Equally important is the need to wear it correctly. The safety belt should be positioned as close to the wearer’s body as possible. Check also that it has not twisted. The safety belt should be taut against the shoulder, with the diagonal section of the belt between the breasts and along the side of the belly. The hip section of the belt should be flat against the side of the thigh, as low as possible below the belly. The belt is not to slide up across the belly. Make sure you are sitting in a comfortable position you should be able to easily reach the steering wheel and the pedals, at the same time as the distance between the steering wheel and upper body your torso - should be as great as possible. Add-on devices are available to help position the safety belt for pregnant women. However, they are not developed in conjunction with the restraint systems in the different vehicles and there is, as yet, no evidence that safety belt positioners actually improve user safety in crashes. In fact, they might even be a hazard by introducing slack to the safety belt. Today researchers and car manufacturers have comprehensive knowhow about how adults and children are best protected in the event of road accidents. There is also research into how best to protect an unborn baby in an accident, although there is still more to learn in this area. Since 2001, researchers at Volvo Car Group have studied pregnant women’s special needs as regards safety and comfort. One result of this work is the development of a unique computerised model of a pregnant woman. This computer model is used to increase the under- standing of how pregnant women can be protected in a collision. Together with data from real road accidents, this model is used in the development and evaluation of car safety. 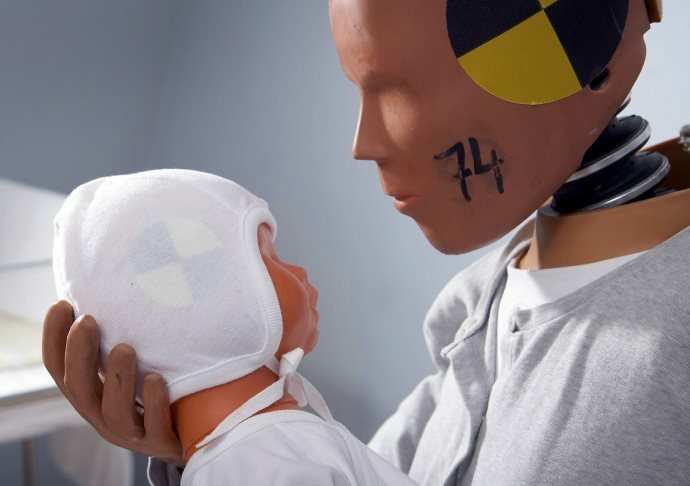 Head injuries are one of the injury categories noted in unborn babies involved in car crashes, both fatal and non-fatal. The most frequently documented cause of death in the unborn, however, is the partial or total detachment of the placenta from the wall of the uterus, which prevents the foetus from getting enough oxygen. The question is, why? Researchers think that the uterus itself is elastic enough to withstand the deformation caused by the crash forces, but that the placenta is not equally elastic and therefore not as resilient. What is perfectly plain, however, is the fact that pregnant women should always use their safety belts. For most babies, their first car ride is the drive home from the maternity unit. It’s an exciting but still rather jittery time for most. A new little person has come into the world. And a new life is beginning for the parents and any older siblings too. Ahead of you is a new routine, punctuated by feeds, sleeps both short and long, and nappy changing. Most things will have been planned and prepared for, but there will always be a few details to iron out. One thing which really must be planned for is that first journey home. Right from the start, your baby needs to have his or her own baby seat - properly anchored, correctly fitted and facing the rear of the car. This baby seat will provide good protection for the first few months of the baby’s life. The seat should always be the right size for the baby. When the baby has grown to such an extent that its head reaches the top of its seat or beyond, the time has come to change to a bigger one. You can, of course, move your baby to a bigger seat earlier than this. There are other kinds of rearward-facing child car seat which provide equally good protection for a growing baby. But they must always be of a suitable size for your baby at the time. Any parent who has ever chosen a car seat for a baby will agree that it is no easy task. Volvo Car Group has its own range of child seats that are tried and tested in cars to ensure that they meet strict demands on safety, usage and installation. There are in addition many other manufacturers and brands on the market. Many of them featuring different methods of attaching and securing the child seat. This can result in parents buying a seat that is not the most optimal for their particular car. Or they may find that the seat they have bought is harder to fit correctly. The car industry had long been aware of this problem, realising the need for a single standard to ensure that all types of child seat can be used in any car and to reduce the likelihood of incorrect installation. In 1999, inter- national cooperation between car manufacturers, child seat manufacturers, public authorities and other stake- holders resulted in ISO Fix - an international standard for anchoring child seats in vehicles. The ISOFix system consists of a specification for the child seat attachments and a corresponding specification for vehicle anchorages. Two anchorage points are built into the car between the backrest and seat cushion. A seat base can be attached securely in place using these anchorage points, and the baby or child seat can then be quickly and easily attached or detached. Also, a third anchorage point “top tether” is positioned on top of the seat. When required by the child seat this should be used as well. Some types of ISOFix seats do not require a separate base. Instead they are attached directly into the car’s anchorage points. Depending on the market, ISOFix child seat connectors are rigid, allowing for a click-in installation, or non-rigid, using latches for attachment. ISOFix anchorage points are to be found in all new cars in most markets. They can also be added to many Volvo models if they were not originally fitted as standard. The number of different child seats available with ISOFix attachments is steadily increasing, but there is still a wider range of seat types secured by the car’s safety belts on offer. What should I look for when choosing a baby seat? The seat must be suitable for your car. The information pack that comes with the seat should clearly identify the car models for which the seat is compatible. There are also seats that suit all car models. This information too should be clearly stated in the information that comes with the seat. What do I need to think about when buying a second-hand baby seat? Don’t buy a second-hand baby seat unless it is a relatively new one. Make sure that any seat you buy is undamaged, has the right type approval label, and that all its fittings and installation instructions are supplied with it. How do you fit a baby seat? Follow the specific instructions carefully. If you encounter any problems, ask the seat retailer for help. A standardised anchorage system for baby and child seats. The ISOFix system is known as LATCH in the United States and UAS in Canada. It is as safe as using the safety belt, if it is correctly attached and tightened. Is a strapped-in carrycot a safe alternative? No, it is not a safe alternative. The carrycot may be fixed in place, but the baby inside it will not be properly restrained. Is a transversal infant bed a safe alternative? For small children that need to lie down in a flat position at all times (e.g. some premature babies), make sure to use an infant bed that is certified for this purpose. A rearward-facing baby seat should be used as soon as the baby can lie in it, as facing the rear is always a safer alternative. What is the best place in the car for a baby seat? In a Volvo, all passenger seat positions are equally safe, but there will probably be other factors influencing your choice of location. Many people prefer to have their baby within reach, i.e. in the front passenger seat. However, if there is an activated passenger airbag in front of that seat, the baby seat must definitely not be installed there, leaving the rear seat as the only option if the front seat has an activated passenger airbag. In some cars, the passenger airbag can be switched off when required. Your car may have a switch for this purpose - check the owner’s manual for instructions. If there is no switch of this kind, one option could be to have the airbag permanently disabled at an authorised dealership. Can you be sure that the airbag really has been switched off or disabled? Yes, the Volvo Passenger Airbag Cut Off Switch (PACOS) is safe and reliable. But you do have to check carefully that the switch is definitely in the OFF position. If you have any doubts about whether the airbag is really disabled, contact your authorised dealership. Check the options for your brand of car and the regulations that apply in your country. For Volvo models in the USA there is a sensor in the seat that switches off the airbag if a child seat or a child is placed in the front seat. Do side airbags pose any risk to the baby? No, not in a Volvo. The baby will not come into contact with side airbags if it is correctly strapped into an appropriate rearward-facing baby seat. Why must babies travel in rearward-facing seats? A baby’s head is large and heavy in relation to the rest of its body, and its neck is still far from fully developed. If the baby were to travel in a forward-facing seat, its neck would be highly vulnerable to the forces acting on it in the event of a frontal collision. How long should we go on using the baby seat? The most important thing is that the seat used should be suitable for the size of the baby at the time, in order to give it the support it needs. Once the baby has grown so that its head reaches the top of its baby seat or beyond, the time has come to move it to a rearward-facing seat for a larger child. What should I do if my baby doesn’t want to sit in its seat? Stop and take a break. It can be a good idea to take a brand new baby seat indoors and let the baby first get used to it at home. The world’s first crash-test dummy was called Sierra Sam. The size of an adult male of large build, he was made in 1949 to test ejector seats for the US Air Force. In 1956 the Air Force shared its findings with the automotive industry. 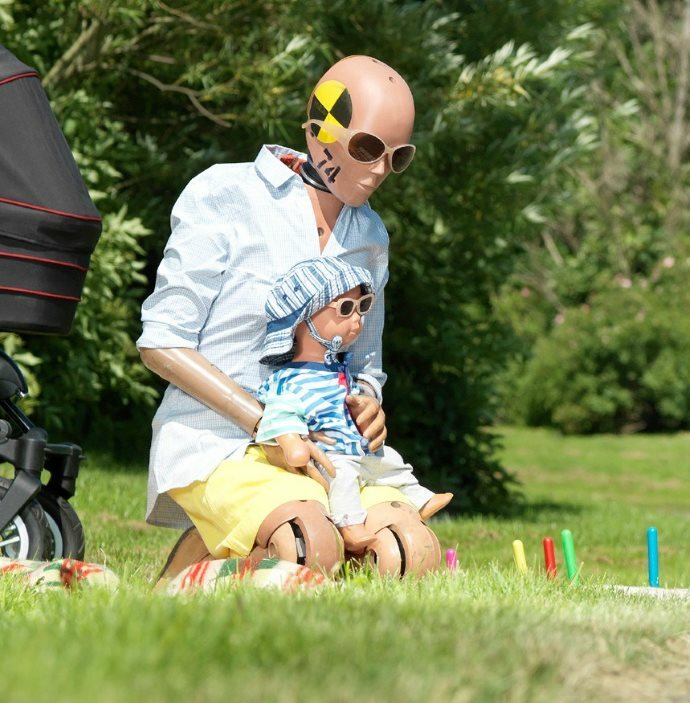 The first dummy to be developed specifically for research on car crashes appeared six years later. Today’s crash dummies have little in common with Sierra Sam. All the early ones were rather rudimentary, built to confirm that safety systems such as safety belts were effective. They had few measurement points, and were not very much like humans at all. Modern crash-test dummies, however, are built to respond much more like humans. They have the same weight, size and proportions as the type of human they are made to simulate. Their heads are designed to react like real heads, as are other parts of their anatomy such as the neck, the knees and the thorax. On the inside they have advanced electronic equipment for measuring acceleration/deceleration, displacements and the various loads and forces to which the body is subjected in a crash. Crash-test dummies come in many sizes and types these days. 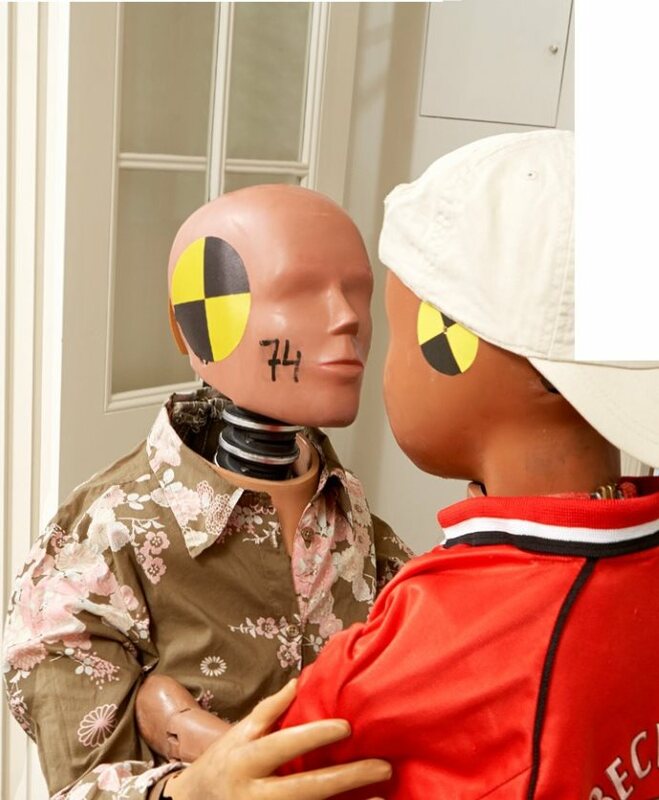 Most are used in frontal crash tests, but there are also dummies developed for testing in side-on and rear-end crashes. The type used most often was developed to represent a mid-sized adult male. There is also an extra tall and heavy variant of the male dummy, but the adult female dummy is remarkably small and petite. So petite that she is also used to represent an average twelve- year-old. Besides this dual-purpose twelve-year-old/woman, there are other child dummies representing children aged ten, six and three years, as well as babies of eighteen, twelve, nine and six months, and new-born babies. Acceleration is measured to find out how quickly some- thing slows down or, in crash-test dummies, to find out just how the human body is restrained and when a car either collides with something or is hit by another vehicle. Displacement measurements are used, for example, to study compression of the human thorax. Bending motions of various parts of the body are studied, as well as the loads to which they are subjected. Force measurements can be used to find out more about how vertebrae in the neck are affected in a crash. Measurements like these allow researchers and engineers to amass a broad spectrum of data and to draw conclusions on the probable effects of road crashes on humans. 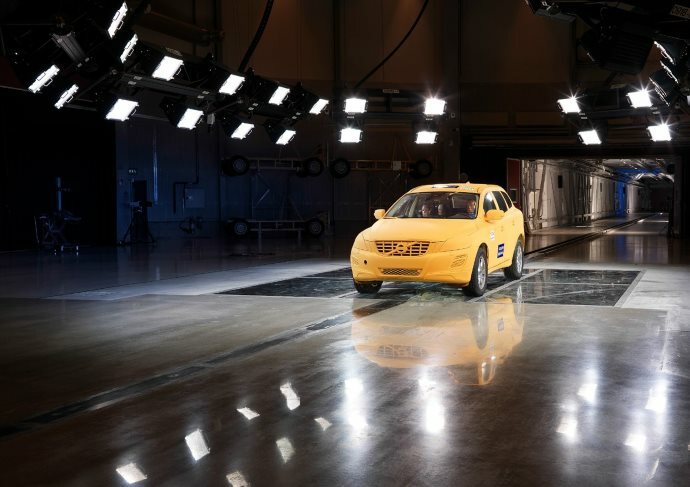 The automotive industry has long been at the forefront of crash-test dummy development, and the pace of safety research development is increasing all the time. Volvo’s own on-going research into the outcomes of actual road crashes shows that the risk of injury among people who have crashes in cars built in early 2000 or later is reduced by two-thirds compared to people travelling in cars built 20 or 30 years earlier. This is mainly because airbags and other safety systems have been continuously improved, and also because car cabins are now stronger than before and better able to withstand the forces unleashed in a collision. Active safety systems with automatic braking in the risk of accidents also improve safety by reducing the force of impact or, in the best-case scenario, even entirely avoiding an accident in the first place. None of these improvements would have been made without research. And crash-test dummies still have an important part to play in this research, as does all the knowledge gleaned from studying real-life crashes. Babies and children are especially fragile passengers. Relative to the rest of their bodies, their heads are large and heavy. The head of a nine-month-old baby, for instance, makes up 25 per cent of its total weight. By way of comparison, the head of an adult male only constitutes six per cent of total body weight. A baby’s head has quite different proportions too. Its face is relatively small com- pared with the rest of its head. If a baby or child suffers head injuries, it often entails brain damage, which is usually much more serious than facial injuries. Head injuries in babies are frequently more severe because their skulls are thinner than an adult’s, providing less protection for the brain. 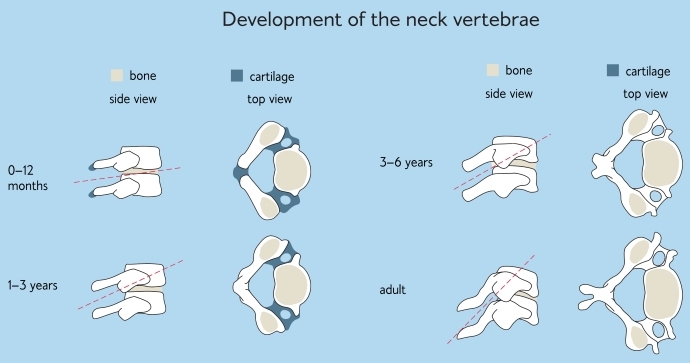 The neck vertebrae of a new-born baby are composed of separate portions of bone joined by cartilage. In other words, the baby’s skeleton is still soft. This cartilage turns into bone over the first three years of the baby’s life. The process of cartilage hardening into bone continues right up until puberty. There is similar gradual development of the muscles and ligaments in the neck. Human neck vertebrae also change shape progressively throughout the years as a person grows, from the horizontal vertebrae of the small child to the saddle-shaped ones of the adult. Being saddle-shaped also means that the vertebrae interlock and support each another if the head is thrown forward. The young child lacks this extra protection. Another factor which makes a child more vulnerable is the fact that its pelvis is still relatively undeveloped. The size and shape of the wearer’s hips has a direct bearing on the way the safety belt stays in place. The shape of the iliac crest in adult hips helps keep the lap belt low down in the event of a crash, preventing it from riding up and possibly damaging the internal organs. Apart from overall size, one key difference between the pelvis of a child and that of an adult is that the distinctive hip bone structure called the iliac crest is not fully developed in the child. The human pelvis remains relatively rounded in shape until the child reaches about ten years old. The iliac crest does not develop its more angular adult shape until puberty. The safest way of travelling in a car is rearwards. It would actually be better for all of us to sit facing the rear of the car, but given the existing designs of our cars, this is not feasible for adults. Young children, however, can and should travel facing the rear of the car for as long as possible. In a frontal impact collision, the head of a forward- facing car occupant is thrown forward with considerable force. Its momentum propels it downwards onto the breastbone and then back up again. An adult neck can withstand this strain relatively well, but a small child’s neck cannot. Given that frontal impact collisions are the commonest type of crash and often the most serious type too, it is particularly important for very young children to sit in rearward-facing seats. The idea of rearward-facing car seats for children came from Sweden in the 1960s, the brainchild of Professor Bertil Aldman of Chalmers University of Technology in Gothenburg. Professor Aldman took his inspiration from the special seats used by Gemini mission astronauts during take-off and landing, which were moulded to distribute G force across the whole back. The principle behind rearward- facing child car seats is exactly the same. In the event of a frontal impact collision, the whole of the child’s back takes the strain of the impact, not just its much weaker neck. Thanks to Professor Aldman, rearward-facing child seats came into widespread use in Sweden much earlier than elsewhere. The benefits are reflected in crash statistics. Research on data from insurance company Folksam, for instance, shows that the risk of a young child being killed or seriously injured is five times greater in a forward-facing seat than in a rearward-facing one. 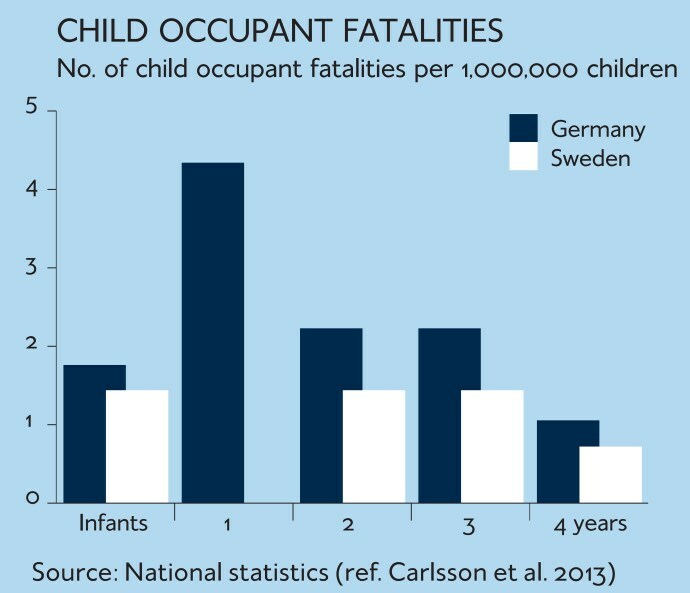 If you compare Swedish crash statistics with those of countries where most children travel facing forwards, the differences are striking. One example is Germany: Note in particular the differences at one year old. That is the age when German children start using forward-facing child seats, whereas more Swedish children travel in rearward-facing seats until the age of three or four. Volvo has been working with Professor Aldman ever since he became involved in child safety. One of the fruits of this collaboration was the rearward-facing child seat launched by Volvo in 1972, a first in the car industry. The Volvo Traffic Accident Research Team has been investigating and collecting data on Swedish road crashes involving relatively new Volvos ever since the early 1970s. The team’s findings are added to a database which, to date, has documented more than 42,000 crashes, involving over 70,000 people in all. A unique resource for researchers wanting to establish more facts about child safety. Between 1976 and 2012, more than 6,500 children aged 0–15 were involved in such crashes. Over the same period, the use of safety belts and child seats increased dramatically, from about 25% in 1976 to almost 100% in the ten most recent years. The risk of a child sustaining injuries as a car occupant has decreased continuously over the years, which is a result of both increased use of restraints and improved vehicle safety. injuries of moderate level or higher for children aged 0-15, using a standard adult safety belt provides approximately 68% better protection than using no restraint at all. The corresponding injury-reducing effects, as com- pared to those with no restraint, is as high as 90% for children using rearward facing child seats and 77% for children using boosters. It is also important for children to use a type of child restraint suitable for their current age, height and weight. How long should children go on using rearward-facing seats? Young children should continue to use rearward-facing seats for as long as possible. A child should only switch to a forward-facing seat when it has grown out of its seat or when its head extends beyond the top of the seat. It is recommended that children go on using rearward-facing seats until they are three years old, but preferably longer. The older a child is, the stronger its neck will have grown. In addition, the taller a child is, the smaller its head will be in relation to the rest of its body. Not being able to stretch out its legs fully will not affect the child’s safety. Because a child’s vulnerable neck cannot withstand the strain involved if the head is flung forward in a frontal impact collision. In a forward-facing seat, the neck is subjected to very substantial forces. In a rearward- facing seat, these forces are distributed across the whole of the child’s back and head. The forces arising in rear-end collisions are generally not as high. What do I need to think about when buying a child car seat? Firstly, the seat must be suitable for your car. Secondly, the seat must be labelled to show that it has the requisite type approval. See here for more information on type approval standards and labelling. How do you fit a rearward-facing child seat? Follow the specific instructions carefully. ISOFix is a standardised anchorage system which often makes it easier to fit child car seats. The rigid ISOFix attachments provide a confirmation (clicking sound and green indication) when correct installation is achieved. A child seat secured using the car’s own safety belt is as safe as one secured using the ISOFix attachments. Just make sure the safety belt is securely tightened. Many Volvo cars also feature additional anchorage points in the front seat floor rails for easy attachment of extra tethers for large rearward facing seats. If you encounter any problems, ask the seat retailer for help. Which is the safest place in the car for a child? In a Volvo, all passenger seat positions are equally safe, but there will probably be other factors influencing your choice of location. Many people prefer to have their child within reach, i.e. in the front passenger seat. However, if there is an activated passenger airbag in front of that seat, the child seat must definitely not be installed there. The rear seat is consequently the only option if the front seat has an activated passenger airbag. In some cars, the passenger airbag can be switched off when required. Your car may have a switch for this purpose - check the owner’s manual for instructions. Yes, the Volvo Passenger Airbag Cut Off Switch (PACOS) is safe and reliable. However, you do have to check carefully that the switch is definitely in the OFF position. If you have any doubts about whether the airbag is really disabled, contact your authorised dealership. Check the options for your brand of car and the regulations that apply in your country. For Volvo models sold in the USA there is a sensor in the seat that switches off the airbag if a child seat or a child is placed in the front passenger seat. Do side airbags pose any risk to my child? 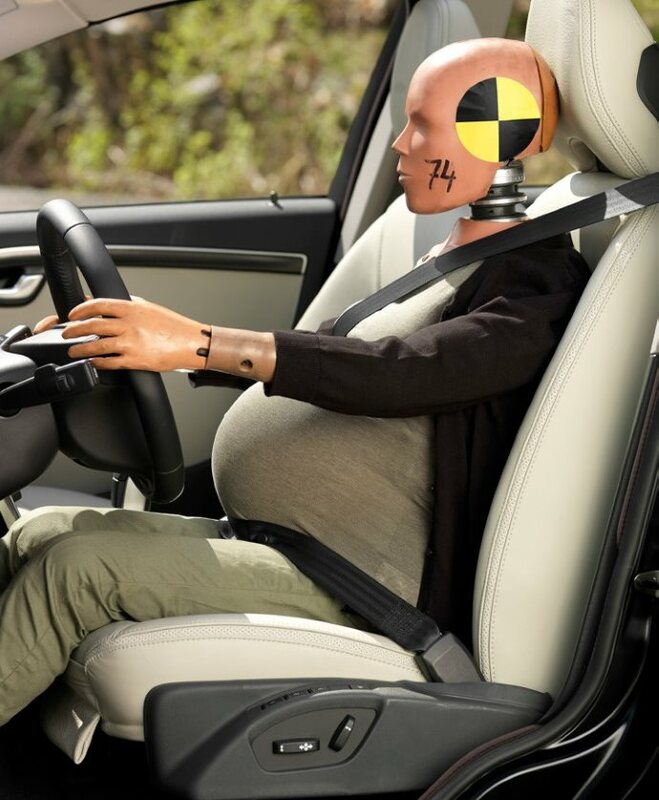 No, Volvo side airbags are designed to keep your child from harm in a collision, as long as he or she is travelling in an appropriate rearward-facing child seat. So take care always to strap your child in correctly. Does it pose any harm if for instance a child plays with a doll or watches a film on a hand-held device? Unsecured items can turn into dangerous projectiles in a collision. Ensure an upright seating position for the child with the belt positioned correctly. What should I do if my child doesn’t want to sit in its seat? Stop and take a break. 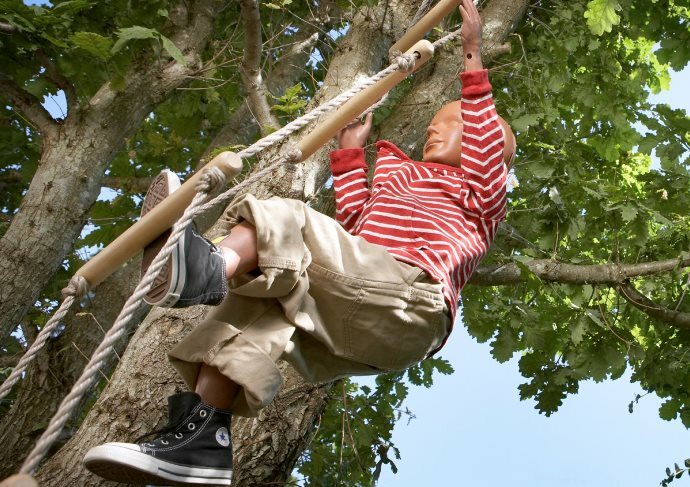 What should I do if my child falls asleep with its head hanging at a sharp angle? If it appears not to bother the child, it probably looks worse than it is. If it bothers you, you can always stop and prop up the child’s head with a pillow or cushion. In Sweden there is a certification called “Plus test”. What is this? 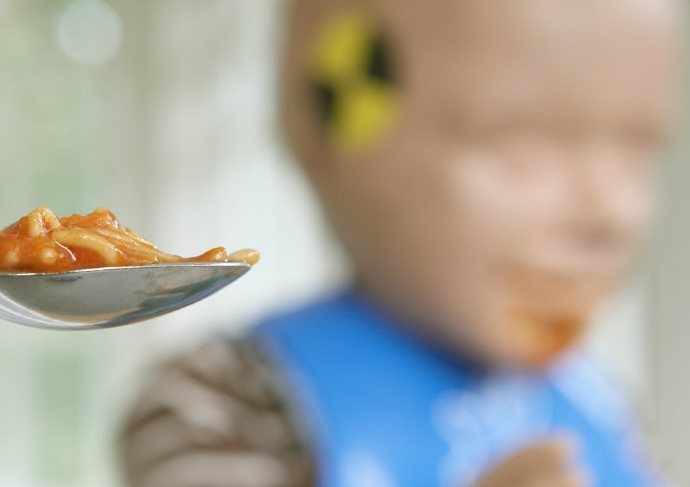 ”Plus test” is a voluntary certification which evaluates child test-dummy neck loads in the ordinary certification test. By choosing a seat with a “Plus test” label you know that it will protect the neck of the child in a crash, something which is not evaluated in the regulatory testing. Sooner or later the child will outgrow its rearward-facing child seat. This is generally at around three or four years old. It is now time for him or her to travel facing forwards, seated on a booster cushion with or without a backrest, also called booster seat. Make sure that the booster cushion’s guiding device is designed to keep the lap belt lowdown in front of the hips and across the tops of the thighs. These projections also help keep the booster cushion in place in a collision. The child and booster are always restrained by using the three-point safety belt. Some booster cushions can also be attached to the vehicle using the ISOFix anchorages. Some cars, including a number of Volvo models, have their own integrated booster cushions - a very user-friendly form of child restraint. In cars without head restraints, a booster cushion with a backrest will provide support for the child’s head in the event of a rear-end collision. Child restraints of these types also generally make the legs of smaller children more comfortable, and any side projections built into the top of the backrest section can provide the child’s head with lateral support, especially when sleeping. 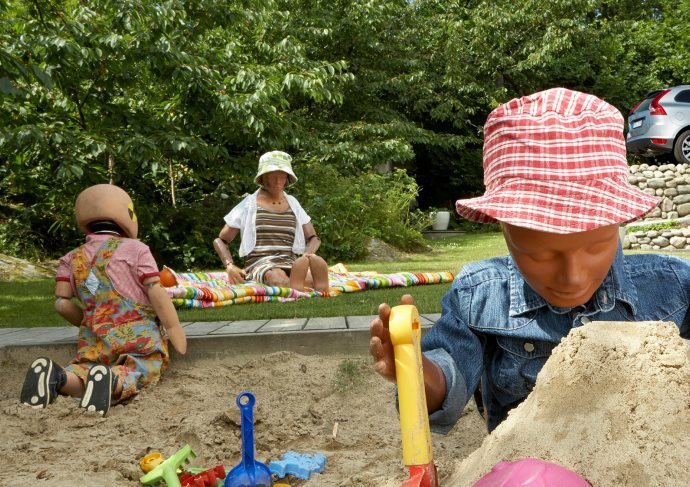 Different types of torso side projections also help the child sit more comfortably and supported, depending on the size and behaviour of the child. Having a backrest for the booster cushion can also help the safety belt stay comfortably in place in the mid-shoulder position. When a child is buckled in using a three-point safety belt, it is important for the belt to be positioned correctly. The main reason for using a booster cushion is not to help the child to see more, but rather to achieve the right belt geometry. Furthermore, the less slack there is, the better the belt will protect your child. The booster cushion is there to raise the child higher, to bring the safety belt into a better position across the hips or thighs. The lap section of the belt must always be worn as low down as possible, and not across the stomach. The diagonal section of the belt should sit firmly across the shoulder and chest, preferably lying comfortably on mid-shoulder. Remove any slack after you have fastened the child’s safety belt. It is not harmful if the belt is partly on the child’s neck. It may not look very comfortable, but it certainly won’t strangle the child if there is a crash. If the car were to stop abruptly, the child’s head would move forward and the belt would move further out onto the shoulder. The risk of injury is much greater if the diagonal belt is worn too far out on the shoulder. This could allow it to slip further down the arm in the event of a crash, increasing the risk of head impact and injuries to the soft parts of the chest and belly. With the belt now too far down the arm, the child would not be restrained as well as it should be. Under no circumstances should the child travel with the diagonal belt under both arms. 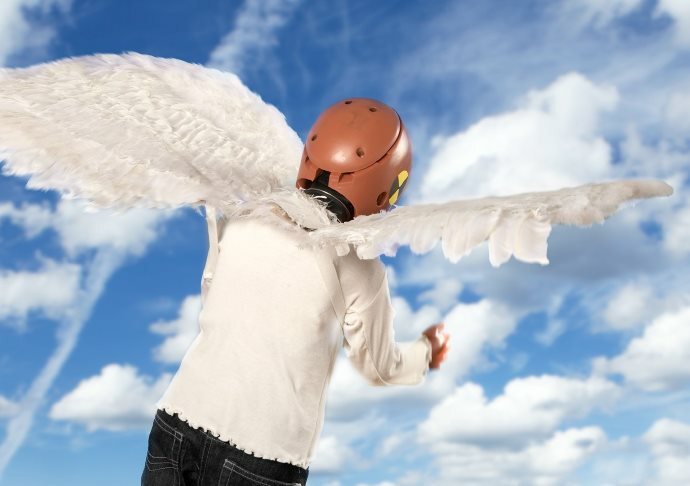 In a crash, the upper body of the child would not be properly restrained, causing an increased risk of head impacts as well as the safety belt penetrating the softer parts of the chest and belly. There would also be a greater risk of chest or stomach injuries because the human skeleton is weaker lower down the thorax. The safety belt provides optimum protection if it is placed across the stronger body parts, such as the pelvis, ribcage and shoulder. Never use an ordinary soft cushion or pillow in place of a proper booster cushion. An ordinary cushion would be too soft and would not be properly anchored like a booster cushion is. In a crash situation, a cushion would simply be flattened, causing the child to slip forward, out under the lap belt. When can I move my child to a forward-facing child restraint system? When the child has grown out of its rearward-facing seat, i.e. when the top of its head is no longer within the child seat, or is touching the top, depending on the type of seat you have. The child should be at least three years old, preferably older. What should I look for when choosing a booster cushion, with or without a backrest? One that is suitable for your type of car, comfortable for your child, and labelled with the correct type approval. Is a booster cushion just as good as a booster cushion with backrest? Smaller children will generally find that a booster cushion with a backrest is more comfortable for their legs. In cars without head restraints, a booster cushion with a backrest will provide extra support behind the head. If there are side projections built into the top of the child’s backrest, these can help provide support to a sleeping child. Otherwise, in a safe car, provided the safety belt is correctly positioned on the child’s body, the level of protection will be the same, with or without a backrest section for the booster cushion. My booster seat backs up against the head restraint, creating a gap between the two. Is this still safe? The car’s own safety belt makes this perfectly safe. It is the car’s safety belt that absorbs the incoming force during harsh braking or in a collision. The headrest’s position may mean that the booster seat has a more upright stance that may be perceived as less comfortable, but the fact is that from the safety viewpoint it is equally good provided the car’s safety belt is correctly positioned. How do you position the safety belt correctly? The diagonal belt should go down across the shoulder, closer to the neck than the edge of the shoulder. It doesn’t matter if the belt is partly on the child’s neck. It is dangerous to position the belt too far out on the shoulder: if the worst comes to the worst, the top of the child’s body could slide out over the belt in a crash. For the same reason, you should never let your child wear the diagonal belt under both arms. The lap belt needs to be worn across the hips or thighs. For most types of accessory booster cushion, the belt needs to be held down by the projections on the booster cushion itself to keep the booster in position as well. There should be no slack present in either the diagonal or the lap belt. Remove any slack after you fasten the child’s safety belt. Are boosters attached in the ISOFix anchors better than those without? The booster’s attachment to the vehicle does not influence the protection provided by the booster and safety belt. The anchorage in the ISOFix attachments helps secure the booster in place even when it is not being used. In both cases it is the safety belt that secures the child in the restraint. Could a child ever use an ordinary cushion instead of a booster cushion, perhaps in someone else’s car? No. An ordinary cushion is too soft. In a crash it could slip forwards or be flattened. The child would risk slipping out beneath the belt. The child should always use a certified booster cushion. Is it alright for the child to sit on an adult’s lap instead? No. Children should never be allowed to travel on laps. Each child needs a place of its own in the car, and a child restraint appropriate for its size and age. Which seat in the car is safest? In a Volvo all seats are equally safe for children, provided they are using an appropriate child restraint. The only exception might be when the front passenger seat has an airbag which has not been switched off or disabled. How tall does a child have to be to travel in the front passenger seat with a frontal airbag which has not been switched off or disabled? 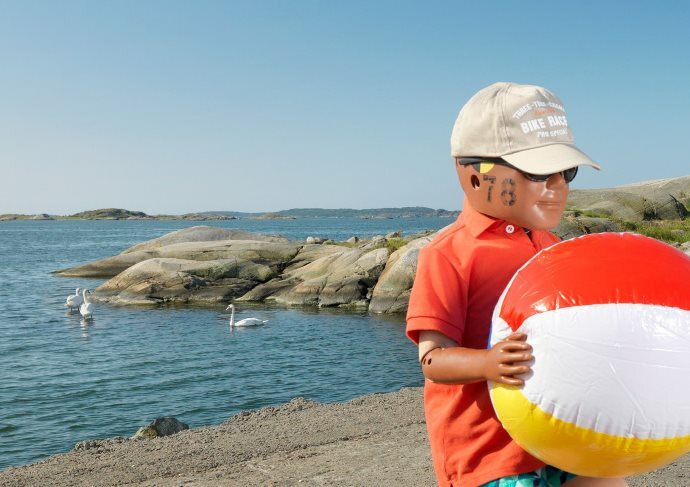 Volvo Car Group recommends that the child should be over 140 centimetres (approx. 4 ft. 7 in.) to sit in the front passenger seat with a frontal airbag activated, but this may vary depending on car model. How long should children go on using a booster cushion? It is difficult to give a precise limit. 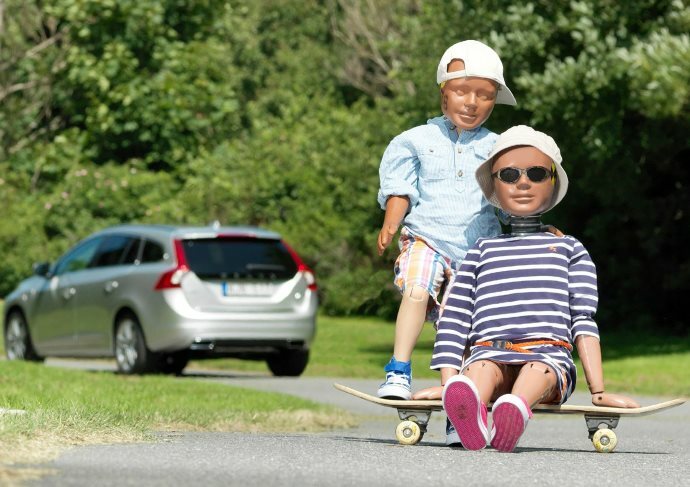 Volvo Car Group recommends children should use a booster until they are 140 centimetres tall and ten years old. The official height recommendations or regulations vary from country to country. The most important thing in terms of crash safety is that the lap belt should be worn correctly across the hips, even after the child has been travelling in the car for a time and has moved about in the safety belt. There should never be any risk of the child sliding under the belt in the event of a traffic accident. Factors here will be the child’s size (height and hip size), age (hip development) and the car’s specific safety belt geometry. 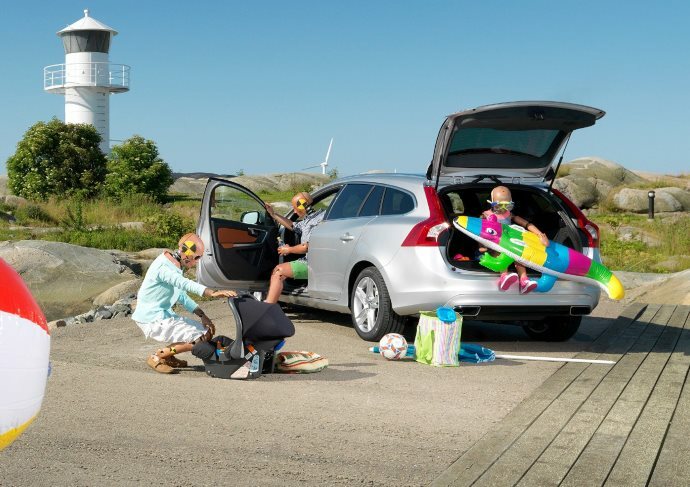 Volvo Car Group’s accident research shows that children aged up to ten should use a booster cushion, but that eleven and twelve-year-olds also benefit from travelling on one. What do I do if my child won’t sit on the booster cushion? You must persuade him or her. What is required by law? The regulations governing which seats children of various ages may use in cars vary from country to country, as do the prescribed types of child restraint. Children travelling in cars should always use an appropriate type of child restraint, correctly fastened. Type approval standards and labels vary from country to country. In Europe and a number of other countries, child and baby seats must be marked with an E, which stands for ECE approval. This means that they com- ply with the appropriate UN ECE regulation for child restraints and are approved for use in countries which apply this standard. Contact your nearest Volvo dealership. Of course, there are always some people who don’t buckle up, some of the time. Perhaps neglecting to put on their own safety belts, or to properly buckle up their kids before they drive off. Maybe it doesn’t seem a long journey at all. Perhaps the child is fractious and it seems impossible to make it stay in the child seat long enough to fasten the straps. Or perhaps they think… it’s just around town, and we won’t be driving very fast. But… at a speed of only 40 km/h (just under 25 mph), a child who normally weighs only 30 kg (66 pounds) will suddenly weigh the equivalent of a tonne in the event of a collision with an unyielding object. That’s a metric tonne - 2,204 pounds! If a child is unrestrained in the rear seat, he or she risks serious injury or even death if the car collides head-on. And anyone in the seat in front risks having this great weight unleashed on them from within the car, with equally serious consequences. Or the child could even go straight through the windscreen and hit the object that stopped the car dead in its tracks - a scenario every bit as terrifying as the first. Travelling unrestrained and then crashing at just 15 km/h (9.3 mph) is rather like climbing up onto a dining chair and letting yourself fall headlong onto the floor. But if the car is going at 20 km/h (12.4 mph), the severity of the crash is more like arranging four dining chairs one on top of the other before you let yourself fall. To visualise a crash at 30 km/h (18.6 mph), imagine arranging eight chairs, one on top of another, before you take the plunge. Eight chairs make quite a tower - and quite a fall. Yet 30 km/h doesn’t seem very fast at all. It’s less than the new 20 mph speed limit in some residential areas in the UK, for instance. Even ‘just around town’, most of us drive faster than that. So… please use those safety belts and child restraints. Always. For everyone in the car. The descriptions and facts in this publication relate to Volvo Car Group’s international model range. The cars, baby and child seats and other accessories available may differ from country to country. The manufacturer reserves the right to make changes at any time and without prior notice. A safety manual has been produced by Volvo Car Group to help all those who carry child passengers - parents, taxi drivers, or anyone else - reach a better under- standing of child safety matters.